The boulder fields at Cherokee Rock Village stand sentinel along an east-facing ridge and overlook Weiss Lake far below. This is an extraordinary location to find Scarlet Tanagers, Summer Tanagers, and Great Crested Flycatchers, and is without doubt the best site for observing soaring raptors in the state. Sample the birds in the old fields and second-growth habitats along the entrance road. Canyon Mouth Park offers visitors one of the few opportunities to access the banks of the Little River by car. This is a good place to experience songbirds in the trees near the river, in the dense understory and woods beyond the picnic areas, and along the narrow path that follows the river upstream into the canyon. Soaring birds of prey are frequently seen in the skies above. Picnic tables, restrooms, and ample parking make this a good stopping place for a midday picnic, either before or after exploring the spectacular canyon rim. 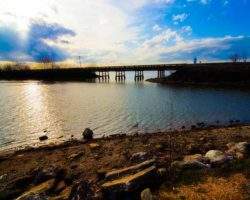 Weiss Lake, a 30,200 acre impoundment owned and operated by the Alabama Power Company, is fed by the Coosa, Chattooga and Little Rivers, and offers over 447 miles of shoreline and shallow flats, large coves, under-water drop offs and deep channels. The preferred starting point for birding Weiss Lake is the boat launch area on the west side of AL 68 in the middle of the Chattooga Bridge, which spans the main body of the lake. This is a good site for gulls, waterfowl, and eagles in winter; for swallows and riparian songbirds in spring and summer; and waders and some shorebirds in late summer and fall.